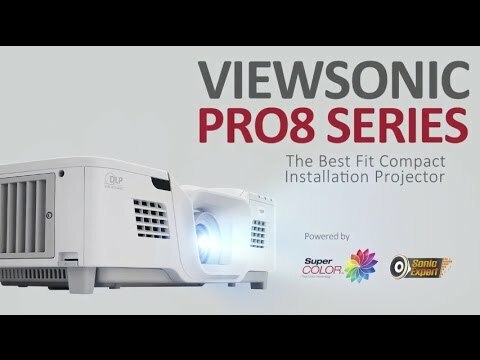 Utilizing a unique "Flex-In" design, the Pro8530HDL integrates an intuitive form, high flexibility and an easy installation process, making it the ideal installation projector. 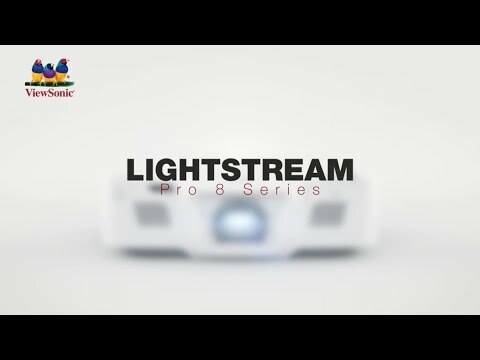 Equipped with 5,200 ANSI Lumens and Full HD resolution, the Pro8530HDL boasts a sleek top cover and an intuitive PortAll® compartment to accommodate HDBT, wireless dongle, or PC stick integration for versatile application, while the cable management and 4-in-1 power button embody a bold and futuristic design. Moreover, the 4 HDMI ports, and centered lens with multiple adjustment in vertical lens shift, 1.6x optical zoom, HV keystone (auto V), and 4-corner offer flexible and easy installation. Powered by SuperColor™ and SonicExpert®, the Pro8530HDL provides a professional audiovisual performance. The Pro8530HDL not only meets large venue Pro AV projection requirements, but is also more than enough for general high-brightness projection. ViewSonic’s "Flex-In" design provides a flexible, yet well-integrated installation that brings easy adjustment and maintenance. ViewSonic’s exclusive PortAll® feature is a hidden compartment with an integrated and secure MHL/HDMI port that lets you discretely stream multimedia content from an HDBT dongle, wireless dongle, PC stick, etc. In addition, the built-in Micro USB cable provides 10W power to HDMI dongles for charging without looking for the power source. A cable management hood connects onto the back of the projector to hide unsightly cable clutter and exposed ports. The specialized power button contains a power key, dongle power indicator, projector control IR receiver, and remote player IR receiver. When activating a dongle from the PortAll® compartment, a tiny blue light will indicate the dongle is in use. Moreover, it can also receive signals to remotely control the connected player. An easy-access top lamp and tool-free ring enable simple lamp maintenance and replacement. Compared to a flat surface air filter, the projector’s advanced waveform air filter catches more dust and improves the life longevity of the projector. With a rounded design and more surface area, more dust and particles can be captured, keeping inside operation smoothly. Power cables can easily become loose over time and can be a hassle to plug back in when the projector is mounted on the ceiling. The power cable lock holder helps to keep the cable secure, with an easy detach mechanism, so cords will not accidently become unplugged. HDBT technology is a cost-effective solution to transmit uncompressed ultra-HD audio & video, 100BaseT Ethernet, IR control and power by a Cat.5e/6/7 LAN cable up to 70 meters that is better than HDMI performance. Based on HDBT technology, the ViewSonic® HDBT dongle fits into the PortAll®, boasting its stable transmission over longer distance, even carrying 4K signals up to 35 meters*, by a Cat.5e/6/7 Lan cable for HDMI-alternative extended installation. Compatible with versatile multimedia device sources and output displays, it also receives control signals to command remote multimedia devices. Fitting into the PortAll®, the ViewSonic® ViewSync® WPG series and other wireless dongles are powerful and compact to enable 1080p multimedia content and documents from mobile devices to projectors. Fitting into the PortAll® compartment, PC sticks can be utilized to transform your projector into a full-fledged computer. Perfect for connecting to any HDMI-enabled multimedia device; the 4 HDMI ports provide more options for HD device deployment. With a centered lens position, the projector is easy to align and even easier to set up, without having to guess and tediously adjust your surroundings. The HDMI port allows users to display 3D images directly from 3D Blu-Ray players and connects to HDMI-enabled devices such as laptops, tablets, and media players. This tool-free control knob controls the lens shift function easily for up and down adjustments of the projection lens. This feature provides flexible projector placement for challenging installations, with less locational limitations. Equipped with a 1.6x optical zoom lens, the projector provides mounting flexibility with a wider throw distance range. This zoom lens also enables the projector to project images up to 60% larger than a conventional projector equipped with a fixed focal lens. Horizontal and vertical Keystone correction, plus auto vertical Keystone eliminates crooked and distorted images for a perfectly proportioned picture every time. The automatic vertical keystone also improves usability and makes setup and image positioning more convenient. Horizontal and vertical Keystone correction can only solve symmetric distorted image problems. When it comes to non-symmetric crooked images, 4-corner adjustment can make images right. A choice of 5 unique view settings provide the best possible viewing experience in any environment regardless of ambient light. Brightest Mode: for environments where extra-high brightness is required; Dynamic Mode: for presentations under daylight environment and text content; Standard Mode: for matching PC or NB color; ViewMatch Mode: for general viewing; Movie Mode: for watching movies with better saturation in a dark environment. Features Full HD 1920 x 1080 (1080p) native resolution for the sharpest and clearest picture available. It supports all types of high definition formats (1080p/1080i/720p) and 3D Blu-ray players. 3D images can be viewed with optional ViewSonic PGD-350 Shutter Glasses, or any other compatible 3D glasses. The sealed optical engine prevents dust and moisture from affecting the lighting system, ensuring the image quality is maintained. Following a groundbreaking proprietary speaker transducer and chamber re-design, projectors deliver full-range sound 20Hz – 20KHz for presentations or off-the-clock home entertainment. The 2 x 10W Cube speakers take pride in quality sound with best-fit Sound Response Curve, and high efficiency of transferring electric power to sound power. The exclusive SonicMode sound settings deliver optimized audio performance for presentations, video clips and music. The "Standard" preset offers the best sound levels for general use. The "Speech" preset enhances the sound of spoken words, making it ideal for projecting speeches and lectures, or for sales calls and video conferencing. The "Entertainment" preset is fine-tuned with more bass and richer mid-high frequencies ideal for music and movies. This projector comes equipped with Crestron RoomView Express, an easy-to-use network management system that lets administrators remotely observe and control over 250 projectors from a single PC, such as power on/off, lamp life etc. To satisfy a presenter’s needs, this remote control contains wireless presenter functions (mouse control, page up-n-down, etc.) and hotkeys for critical, major functions. A programmable hotkey “MyButton” can be configured to launch the most commonly used functions. Users can also Control up to eight projectors in the same venue or from a mobile device via free vRemote app.